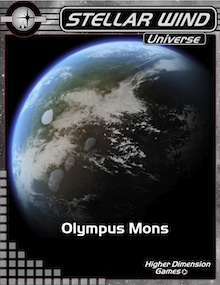 Olympus Mons is a universe book for Stellar Wind and provides a setting GMs can use to give flavor to their campaigns. With a touch of Ayn Rand, a touch of Heinlein and a slightly larger touch of Poul Anderson as inspiration, Olympus Mons is set in a time when the solar system is settled; great fusion-powered "scoop ships" travel back and forth between the stars; and a powerful, wealthy, terraformed Mars is the center of human civilization. Be aware that Olympus Mons is a setting for GMs who want their SF particularly hard. It does not include alien races or faster than light space travel.